Kenya is one of several East African countries suffering from food shortages because of devastating drought conditions. According to Red Cross, almost 3 million people are affected by drought. But in Busia county there is hope growing among farmers and a real potential solution to the situation. 49-year-old Rachel Amoit has barely been earning from her farming to cater for her family of 9 children. But today her life is different. 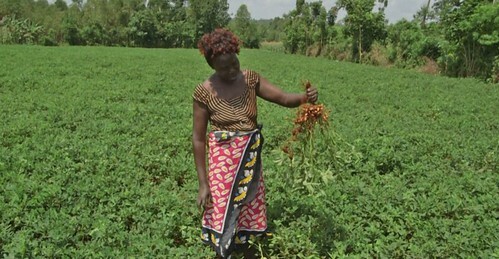 Rachel is one of the beneficiaries of USAID Feed the Future Kenya Accelerated Value Chain Development (AVCD) Program that has helped over 70,000 farmers replace their water-thirsty crops with drought tolerant crops. “I used to work as a community health nurse”, she continues. “But I have since left my nursing job to become a farmer. My wish is to promote farming as a source of nutritious food particularly for community members with special nutritional needs particularly expectant mothers and children. They don’t always have to buy food from the shops”. The project is working to develop the whole value chain from seeds to consumption. It seeks to improve household nutrition by diversifying diets, increase household incomes from marketable surplus and mitigate the effects of climate change by ensuring that farm families have access to nutritious food even in bad seasons. One of the activities of the project team is to educate farmers on crop-specific agronomic practices including water harvesting, intercropping, and conservation farming practices. “I did not know when to plant, what crops are suitable for this climate, the ideal varieties or even how to plant them. This Feed the Future program has helped me a lot. Now I know how to plant, what seed varieties to use and when to plant. I now know the crops which are drought and heat resilient and more suitable for dry areas such as this. Sorghum and groundnuts have improved my livelihood greatly. For example, last season, I made a profit of over $200 within a short period of time which I used to dig a borehole. Now I don’t have to struggle with fetching water from the river anymore”. The program recognizes that an increase in agricultural productivity and incomes alone does not result in improved nutrition status. The drought tolerant crops component has activities along the value chain whose aim is to achieve both inclusive agriculture growth and improve nutrition status. The team has partnered with county departments of agriculture and health and has so far reached over 48,000 households with nutrition messages and sensitized them on the nutritional value and health benefits of drought tolerant crops. “My family now eats nutritious foods like finger millet, sorghum, groundnuts and greengrams”, she says. “With greengrams I prepare stew to eat with chapati. I also make finger millet mandazi for children and sorghum porridge. These grains are very smart. My husband and I together with the casual workers take porridge in the morning before going to work. These foods are rich in calcium, zinc and other important nutrients. They are particularly important for expectant mothers so that they can give birth to strong healthy children with a high rate of immunity”, she adds. “I am very grateful to ICRISAT and Feed the Future AVCD for the education and support. I will continue with farming in spite of people’s concerns that I may be getting too old for farming. My advice to people who want to be successful in farming is to stay focused and dedicated”.